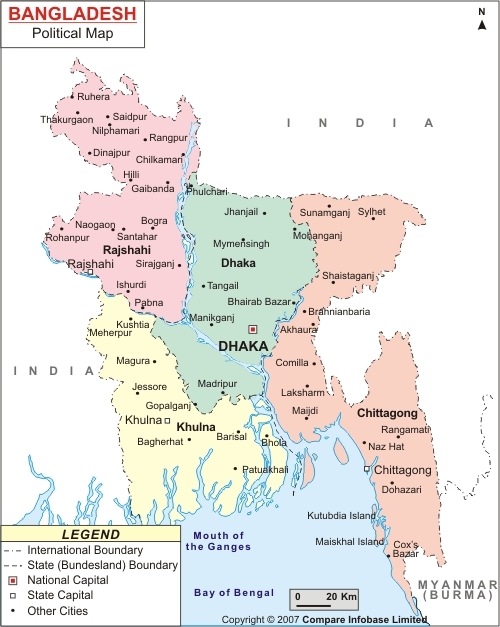 The total area of Bangladesh is 56,977 square miles (1,48,393 square kilometer). In 2011, the estimated population of the country was 142,319,000. In the Map of Bangladesh, 8 divisions and districts are showing separately. Bangladesh is a sovereign state & join its borders with India from west, north, east sides except for Mayanmer in the south-east & Bay of Bengal in the south. This Bangladesh Map also highlights the capital city, other major cities, districts, and political map of Bangladesh. Dhaka, the capital of Bangladesh is clearly stands in the center of the map. Dhaka is located on the banks of River Buriganga. It is known as the “City of Mosques”. 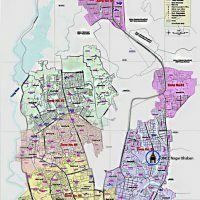 The other main cities of Bangladesh are Chittagong, Khulna, Rajshahi, Sylhet, Rangpur, Barisal, Mymensingh are also administrative divisions of the Bangladesh. Dhaka and other 8 divisions divided into 64 districts. How many Divisions in Bangladesh? There are 8 Divisions in Bangladesh are Dhaka, Chittagong, Rajshahi, Khulna, Rangpur, Sylhet, Barisal and Mymensinngh (new division ). 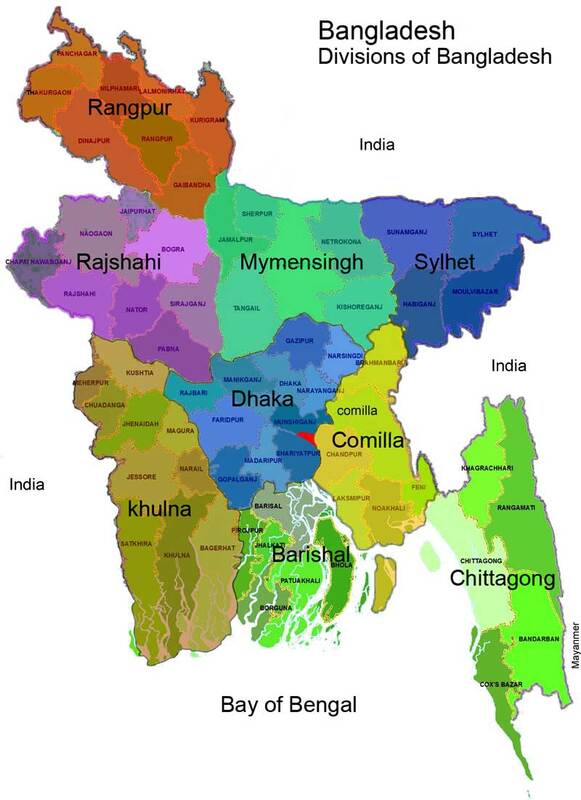 Proposed Divisions are Comilla Division, Faridpur Division and Noakhali Division. 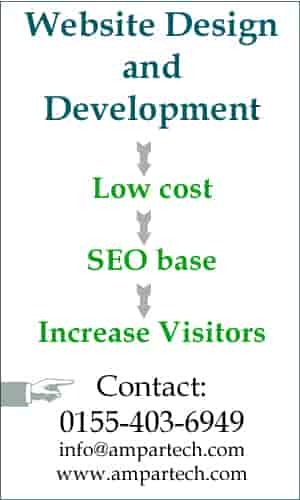 Barisal division is situated in the south of Bangladesh, Boarding division are Khulna in the west, Chittagong in the south and Dhaka in the north. Chittagong is situated on south-east side of the map of Bangladesh. Chittagong Division is boarding by Barisal in the west, Dhaka and Sylhet in the West-North sides of the map of Bangladesh. World Longest sea beach is also located on the bay of Bengal, South of the Chittagong. Dhaka is the situated in the center of Bangladesh sounding by Rajshahi, Khulna, Barisal, Chittagong and Mymensing. Khulna Division is situated in the South-West Side of Bangladesh. Dhaka and Barisal is in the East side of the map of Bangladesh. The Dhaka Division was divided into two are Dhaka and Mymensingh Division. Mymensing Division is situated on the North of the Map of Bangladesh. Sylhet in the south, Rangpur in the North-West and Rajshah in the West of Mymensingh Division. Rajshahi Division is adjourn to Dhaka Division, just west side of Dhaka. Other Bordering divisions are Mymensing in the East and Rangpur in the North. Rangpur Division is situated in the north side of Bangladesh. Boarding division is Rajshahi in the South, Mymensingh in the South-East. Sylhet Division is situated on the North-East side the Map of Bangladesh. Sylhet is famous is for Beautiful tea Garden. In the New Map of Bangladesh showing latest Divisions of Bangladesh. Above Bangladesh Map Picture is indicated divisions with different colors. Bangladesh map 64 districts showing under the division of Bangladesh. Position of Divisions in the Map of Bangladesh. Dhaka division is in the middle of Bangladesh with bordering Barisal, Khulna, Comilla, Mymensingh, Rajshahi. Rajshahi Division in north-west of Bangladeshi Map with boarding Khulna, Mymensing and Dhaka. Sylhet Division in the North-east of Bangladesh Map with boardering Mymensing and Comilla. Chittagong Division is in the East-South of Bangladesh map with boardeing Barisal and Dhaka. Barisal division is in the North of Bangladesh Map with bordering Dhaka, Khulna and Chittagong. Khulna is in the South-west of Bangladesh with bordering Barisal, Rajshahi and Dhaka. If you compare with Bangladeshi map old one with with new map, you will see new division that separated from old division. 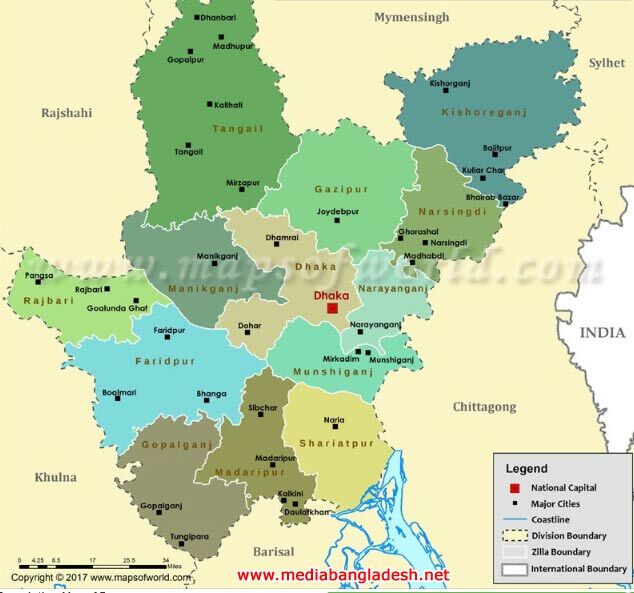 There are no chance to increase district, in Bangladesh map 64 districts are existing for many years. 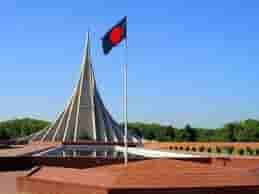 Though we have see couple of upazila or Union were divided in upazila or union.